David is also our Safeguarding Representative. was Licensed at a well-attended evening service at St James' church, Swimbridge, on 12th June 2012. 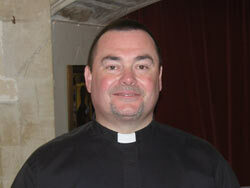 Shaun came to us from Stockport in Cheshire where he served as the vicar of St Mary's church, Reddish. "I have always been an active Christian and have been involved in the church all my life. I had always felt drawn to something else in life and I always had a deep sense that I was being called. Thankfully, after a long period of challenging myself and building the trust in God that I had always needed, this became a reality. I have served thankfully in inner-city environments where rectories have bars on windows and doors, to the suburbs and semi-rural parishes where life was so much different. I have always had a desire to serve in a rural setting, there is something about the sense of creation and rebirth, the following of the seasons, the love and respect of the land that I find deeply spiritual. The gifts of the land, the animals and crops that sustain us, the beauty, and even the hardship is the eternal thread of Life into which God has blessed us. I look forward to becoming part of the communities in which I serve, my door always open, a welcome always given. Thank you each and every one of you for the opportunity to live, pray and share God's ministry."